KPIs can also define actions. See “Defining Custom Actions” in Implementing InterSystems Business Intelligence. In typical cases, you add a WHERE clause (or %FILTER, for an MDX query) that restricts the records used by the query. Then when the user refreshes the dashboard, the system reruns the query and displays the results. For details on how this works, see “Additional MDX KPI Examples,” later in this chapter. You could instead specify filter names at runtime. See “Other Options for Defining Filter Names and Items,” later in this chapter. You could instead hardcode the filter items; see “Other Options for Defining Filter Names and Items,” later in this chapter. Modify the query to use the value or values selected by the user. See “Modifying an MDX Query to Use Filter Values,” later in this chapter. If the logical names of the filters are MDX level identifiers, you can use a simple implementation as shown previously. If not, it is necessary to do more work before getting the members. For examples, see “Using Custom Logic to Build the List of Filter Items at Runtime,” later in this chapter. pCube is the logical name of a cube, with .cube appended to it. Or you could instead specify filter names at runtime. See “Other Options for Defining Filter Names and Items,” later in this chapter. Modify the query to use the value or values selected by the user. See “Modifying an SQL Query to Use Filter Values,” later in this chapter. Set sql = "SELECT DISTINCT DxAgeGroup FROM BI_Model_PatientsCube.DxAgeGroup"
For an example, see the method BuildString() in the sample class BI.Utils.MDXAutoFiltersKPI. sql_field_expression is an SQL field name and can include arrow syntax. filter_name is the name of a filter defined in this KPI. The following example is from the sample class BI.Model.KPIs.DemoSQL. In this case, the filter adds GROUP BY and ORDER BY clauses to the SQL query. 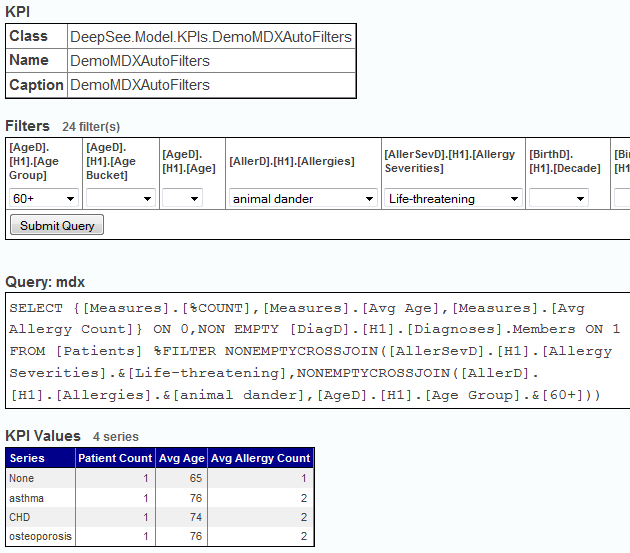 Set pSQL = "SELECT Count(*),AVG(Age) FROM BI_Study.Patient "
This KPI extends the sample BI.Utils.MDXAutoFiltersKPI, which defines the filters and rewrites the query. %OnGetFilterMembers() is implemented. For each level, it retrieves the level members, in the format required by pivot tables; see “Filter Syntax for Pivot Tables,” earlier in this chapter. The method should return an SQL SELECT query. In this query, you can also use arrow syntax and SQL functions, as with other listings.